Over a lifetime of swimming pool construction, renovation and repair I have encountered some truly awful attempts at working on swimming pools. While pool owners are well known for trying some unconventional repair ideas, by far the worst of the worst swimming pools were ones that unqualified "pool guys" tried to take on. 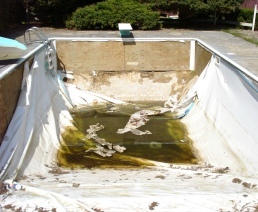 Regardless of the origin of the disaster, this page is devoted to profiling some of the worst swimming pools out there. 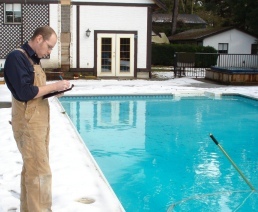 If you are a pool owner, or a pool industry worker, and you would like to share your encounter with a terrible pool or substandard pool work, please contact Steve via email to be featured in this section. There must be one pool leak above all others that stands out as the worst one in history. This is what I had in mind when I went searching for compelling content for this website. The story that I found is so much more amazing than I ever could have expected. This is the story of how water mastery allowed a giant population to grow and how leaking water brought an end to one of the worlds largest ancient cities. There might be more than one way to skin a cat, but this plumbing installation is not just wrong...it is wrong in a record breaking number of ways. So many ways that it earns this spot atop the list of the worst of the worst in the swimming pool hall of shame. This is a hall of shame worthy story about how swimming pools can surprise you...even when you think you have seen it all. The story starts with a vinyl liner pool that needs repair and a pool owner that does not speak my language. Literally. If you have ever taken on a project that you wished that you had not then you will appreciate this story about taking over a poorly built concrete pool installation. While the end result was a functional pool and everyone got paid, it was still a nightmare from my perspective and certainly one of the worst attempts at building a pool I have ever encountered. I have worked with dozens of different swimming pool and construction companies, and hundreds of employees, over the many years I have been active in the pool industry. These are the stories of the people who stand out as the worst workers that I have ever had the misfortune of having to work with.